In 2012, world-renowned contemporary artist Yayoi Kusama released an edition of Alice in Wonderland featuring her illustrations. You may have heard of Yayoi Kusama because of her Tate Modern exhibition from the same year, or because of the popularity of her Mirror Rooms on Instagram. Kusama’s illustrations for Alice are completely in keeping with the rest of her body of work. Some hallmarks include a repeated dot motif, plant life, and the use of bold, saturated color. She’s known for her whimsical approach to contemporary artistic practice, and that whimsy makes her a perfect match for this text. The above illustration is perhaps the most in line with Kusama’s previous works. The yellow and black color palette is reminiscent of her Pumpkins series, and mushrooms are a subject matter she has used in some of her previous pieces (example below). This particular page shows how artists can apply their own styles to Alice and make her story contemporary. Kusama’s illustrations are also just delightful in general. This one, that accompanies the poem about the crocodile tears, really displays how well suited this artist is to adapt the world of Alice. The colors are bright and almost psychedelic, reflecting the vibrancy of the characters of Wonderland. I can imagine that both kids and contemporary art connoisseurs would love these wacky pictures equally. What I most love about Kusama’s illustrations is how well they show just one exciting iteration of the different adaptations of Alice in Wonderland that artists have done since it was published. In class, we talked about the extent to which this weird little book has stayed in the popular consciousness, and has been dissected, updated, and altered for different eras. This artist’s understanding of Alice may be widely different from Dodgson’s or Tenniel’s, but it manages to still be true to the fantastical nature of the adventures, albeit with a more abstract, contemporary aesthetic. I also really love this idea of art passing hands as it moves through time. There is certainly a endurance to Alice which allows it to move so freely between interpretations; the story itself as we see in Dodgson’s own relationship with it evolved within his own thinking from an object of personal value to something worth sharing on a wider scale. The idea that a work of art or writing can have multiple identities and states of being across its existence shows itself most clearly in examples like the Kusama illustrations. While the original audience and progenitors of the work are past, the work itself takes on new life and lends itself to adaptation (both faithful and revised) and reinvention, refocusing itself within new contexts of current society. 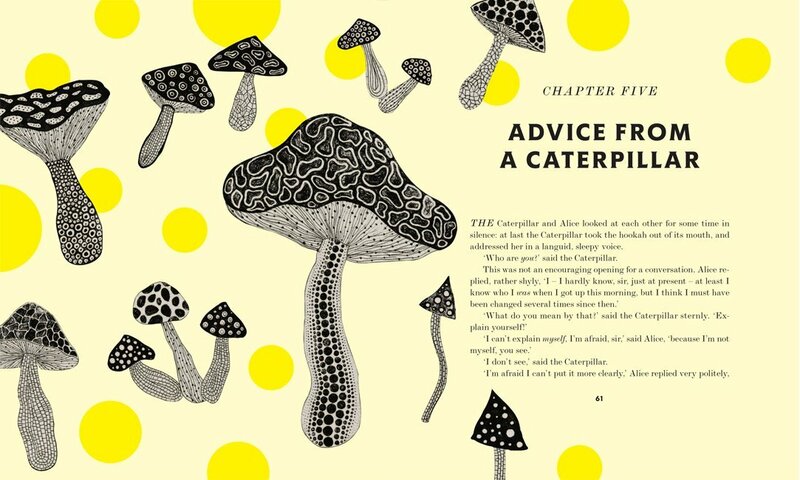 I absolutely loved the illustrations you included and immediately googled to find more of Kusama’s illustrations for Alice. A major point of my thesis was regarding the validity and importance of the interpretation of enduring works by other artists over time. I strongly believe that new artists interpretations can bring important elements of understanding and truth to a work, particularly in the case of Carroll’s text. The original Tenniel illustrations lack a lot of depth, as we spoke about in class, he came from his Punch cartoon background, which caused him to use stereotypes and norms in order to appeal to the masses of Britain which caused his interpretation of Carroll’s work to lose it’s pioneering potential, since Carroll had produced a text so different from anything else that existed at the time. 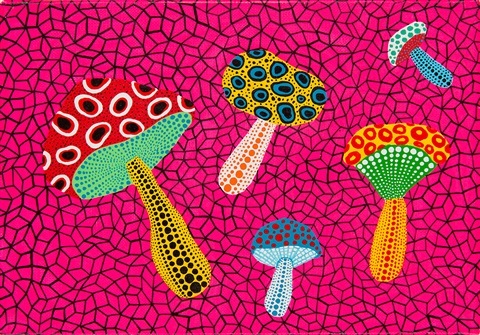 These illustrations by Kusama are certainly some of the most modern I’ve seen. 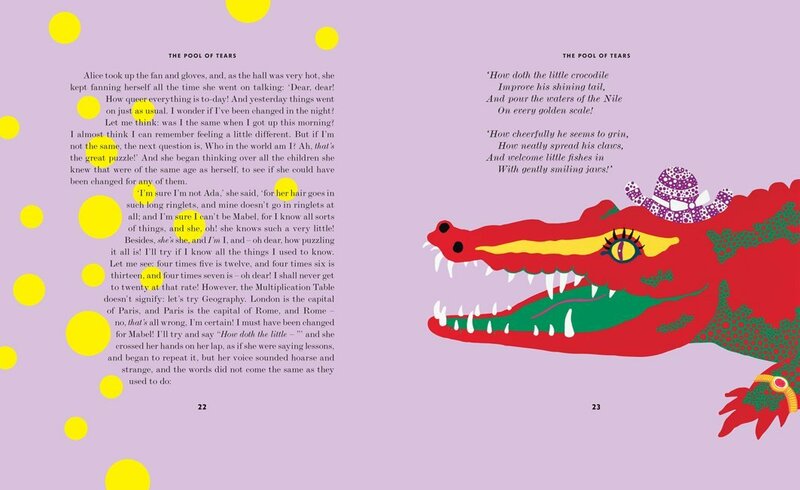 I love the vibrant colors which seem very fitting for Wonderland, as well as the patterns of shapes, which seem to echo Carroll’s mathematical sensibilities. I also came across a quote from Kusama while looking at this work, “I, Kusama, am the modern Alice in Wonderland.” Which I love! Because it just goes to show that so many artists (I am mainly referencing the Surrealists) feel artist power in laying claim to this work. It also means that her specific understanding of Alice (as every artists is different), has some implication of her own self. I wonder if when she says this she is referring to the entire text or specifically the character of Alice herself? Thanks for sharing these! I love finding new Alices.